Once you have formed your business entity, you may need to obtain a Federal Employer Identification Number (EIN). If your company will have employees, you will need to register for payroll taxes. 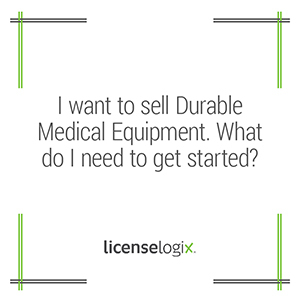 Next you will need to determine if any specific licenses are required to sell durable medical equipment (DME) at retail. Currently twenty six states require a retail DME license. The license requirement sometimes depends on the type of DME’s that will be sold. The licenses are often administered by the state Board of Pharmacy. Common application requirements include corporate documents, fingerprints of owners and officers, and proof of insurance. DME retailers often must obtain a sales tax permit from each state they operate in. DME retailers may also need to obtain accreditation from one of the 10 national accreditation service approved by the Center for Medicare & Medicaid Services (CMS). If you wish to participate in Medicare or Medicaid, additional registrations may be required. See the CMS for more information. LicenseLogix can help DME retailers obtain state licenses. We can guide you through the licensing process, minimizing time-consuming and costly delays. For additional help you can fill in the form on the bottom or give us a call at (800) 292-0909.